The Agency Optic System (AOS) cut is the most robust optic cut out in today's market. Some of the key features include, Variety of Optic Adapter Plates, Modular Rear Sight placement, wider variety of iron sights, and Robust attachment system. The AOS is currently being released with the following Optic adapter plates: Trijicon RMR, Leupold DeltaPoint Pro, Vortex Viper, and the Shield Optics RMS. As new optics are introduced, adapter plates will be designed and added. Each model will have 2 configurations to allow the end user to choose the location of their rear sight (Rear Sight Forward of the Optic and Rear Sight Behind the Optic). 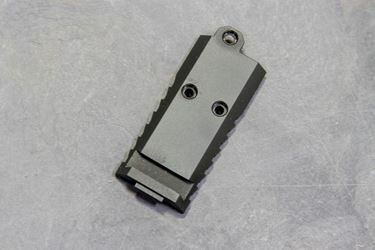 With the AOS cut, the optic will sit as low as a slide with a dedicated Optic Cut. This allows the end user to have a greater selection of Iron Sights, they will not require sights for a specific Modular optic system. 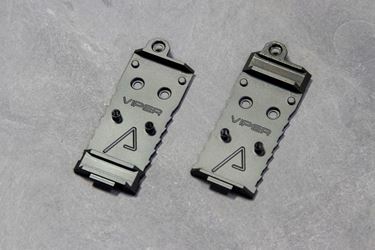 The adapter plate features a locking tab, center rib and 3 set screws. Not only is the adapter plate more robust, the adapter plates are precisely machined for each optic. All these factors provide a secure mounting system and a system that will retain zero during re-installation. Previously milled slides will require at minimum 3/16" (0.1875") of unmodified slide in the rear.